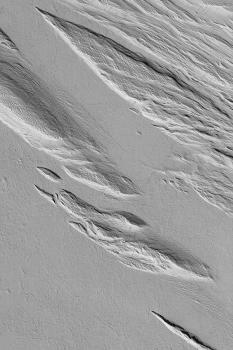 Yardangs are wind erosion features shaped somewhat like inverted boat hulls. Yardangs are common on Mars, as wind is the most erosive agent acting today on this desert planet. This Mars Global Surveyor (MGS) Mars Orbiter Camera (MOC) image shows an example located in the vicinity of the Gordii Dorsum near 4.2°S, 159.9°W. Sunlight illuminates the scene from the lower left; the picture covers an area 3 km (1.9 mi) wide.